Shelley Ettinger writes in her Blog Read Red , “I never say rest in peace because it’s silly, it’s not materialist, dead people don’t ‘rest,’ they simply cease to exist at least as living organisms. 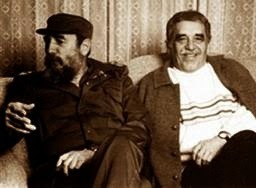 In the case of the great novelist Gabriel Garcia Marquez, who died today [April 17, 2014] and is now being eulogized by folks across the class spectrum, it would be a shame to let his legacy swiftly settle into something mushy, malleable, palatable to oppressor as well as the oppressed with whom he stood for most of his life. So here, in images because who can dare try words in tribute to such a master, a few reminders of which side he was on. 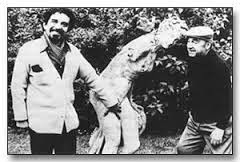 “The first two [images], of course, are the writer with Fidel. 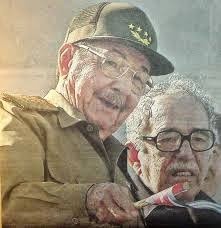 The next one, very recent, shows him with current Cuban President Raul Castro. 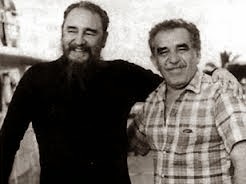 The last one is a young Garcia Marquez with Pablo Neruda, who would be assasinated by the U.S.-backed Chilean fascist coup regime in September 1973. For the New York Times Obit, click here; and here for the Huffington Post.